Today’s technology has given companies and employees the flexibility to work from virtually anywhere. Tech has given us the ability to work remotely, keep up to date with the office while traveling and to facilitate a great work/life balance. But it comes at a cost. Security and safety of files and servers is a daily concern, and the more people work remotely on various devices (phone, tablet, laptop), the more this concern is magnified. All those devices, out of reach of IT, can become infected with malware that may also infiltrate the company’s network putting valuable company data at risk. Even mobile devices are at risk, as they can be lost, stolen or even accessed by a. Construction and facility management industries aren’t immune to data breaches. Both have team members traveling and working out in the field, making it increasingly important to keep critical data safe as the susceptibility of data increases the more the team works remotely. It may seem intuitive, but it’s surprising how many people not only use week passwords, but also rarely change them. However, using a complex password is one of the easiest ways to protect your important data. Remember to update them regularly and use a combination of letters, numbers and special characters. It’s also a good practice not to allow your device to “remember” passwords. For convenience sake, you might be tempted to use unknown Wi-Fi while you’re working offsite, but it might not be safe. Consider using a hotspot or your phone’s personal hotspot. A hotspot protected by robust passwords may provide better protection than public wireless Internet. Also, if you do use public Wi-Fi, double check to make sure you are on the right network. Hackers will try to fool you and use a similar network name. By switching on the “Find My Phone” mode, you’ll have better chances to locate your phone if it’s lost, left behind or stolen. If you’ve lost a phone before and want extra tracking, you can also install special software that includes a geo-locater and will lock down the phone and even delete passwords. It’s easy to procrastinate on updating your software, but the truth is it only takes a few minutes. That is time well spent as these updates could save you from a cyber-attack. Whenever possible, always choose 2-step verification for your accounts. This adds a second layer of security and gives you peace of mind from data breaches, phishing attacks and password leaks. Cloud-based platforms are the backbone for allowing your team to work in different locations. These applications allow easy access, real-time collaboration and file sharing. And, most cloud-based platforms can help keep your data safe in the event your device is stolen or compromised by a hacker or virus. So it’s important to make sure any cloud-based products you use have solid security measures in place to protect your data. 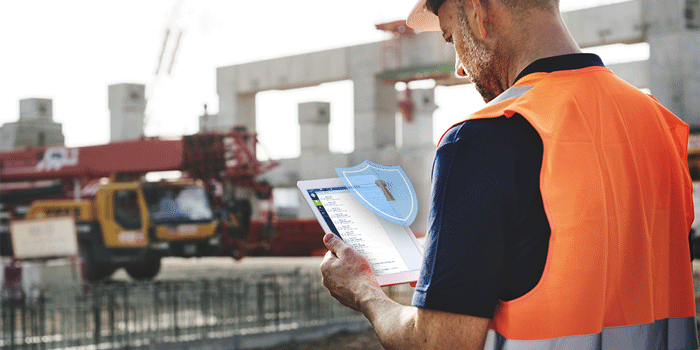 Even your cloud-based construction and facility management software, like SKYSITE, keeps your information secure by offering 2-step verification and Single Sign-on. The more vigilant you and your remote team are about safety and security best practices, the more protected your company data will be. Download link not available now, please contact support.